Dec. 18, 2018 – Carrier Lumber’s Tabor sawmill in Prince George, B.C., reflects the company’s motto: “A tradition of innovation and quality,” where traditional family values and a quality lumber product are produced with innovative equipment and custom solutions tailored to solve the mill’s specific challenges. The source of the bespoke equipment is Carrier Manufacturing, a fabrication shop owned by Carrier Forest Products Ltd. that neighbours the Tabor mill. 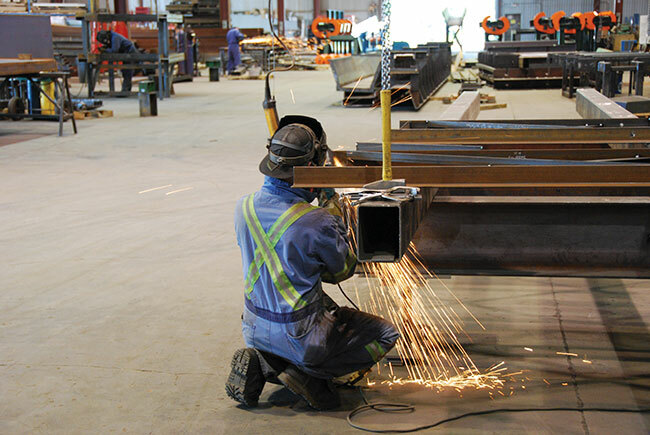 The 76,000 square foot facility holds the claim of the largest fab shop in northern B.C. There, industrial equipment is built and shipped to sawmills across North America. 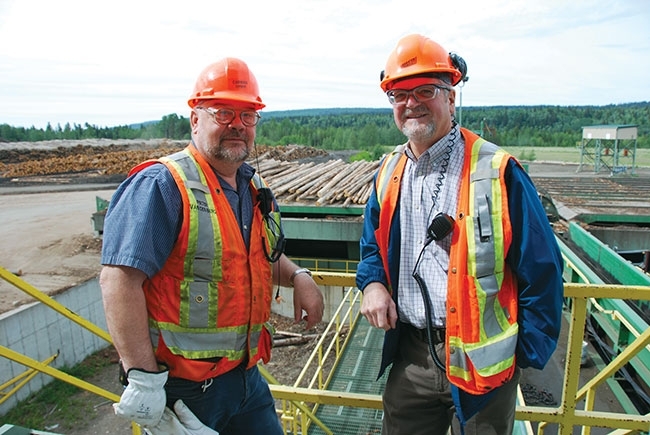 “Carrier Manufacturing supports Carrier Lumber’s operation in Prince George and Carrier Forest Product’s Big River mill in Saskatchewan, but the bulk of our work is outside manufacturing and subcontracting for other equipment providers. We work with many partners to build vibrating conveyors, log singulators, log decks, transfers, tilt hoists, and many other mill components for distribution around the world,” Carrier president Bill Kordyban explains while giving CFI a tour of the Tabor sawmill and fabrication shop in June. “As a fabrication shop that builds for other users, because we are ourselves a user we can bring a lot of the experience from the milling side to help inform how they’re built,” Kordyban says. When it comes to their own mill, Carrier Lumber works closely with other equipment providers to design and build equipment to their exact specifications. Conveniently, the fabrication shop also speeds up the installation timeline. “If we need something done, the fabrication shop can usually find a way to get it done,” Kordyban says. Carrier’s most recent project was building an RTL (retract to load) log singulator for Brunette. Designed by Brunette with input from Carrier, the equipment was manufactured in the fabrication shop and installed in the Tabor mill on their large USNR log line. “It was fortuitous. Brunette came to us with the idea of the RTL and we liked it. They wanted to check with us, as end users, as they were designing it to know whether or not these improvements were on the right track,” Kordyban says. The RTL works by parking a log above the conveyor, held in place by a nose section. Once ready, the nose section retracts, dropping the log in, while the next log in queue is positioned. The smooth motion uses gravity, rather than machine force, to assist the loading process, which limits the damage to the logs as well as machine wear on both the singulator and the conveyor. The RTL replaces a step feeder that pushes the logs up and over the lip of the machine onto the conveyor. Carrier’s other bins have the old step feeders in place working side by side the new RTL. We watched as logs on the older lines were pounded one by one up and onto the conveyor, while the RTL logs dropped easily in place with minimal bounce. Since it was installed last year, the singulator has had no maintenance issues. “There is definitely less wear and tear on the bell crank on the bottom because it is much smoother and you’re not accelerating and pushing all that mass. It makes a lot of sense. Everything on the unit has been beefed up where it needs to be. Brunette addressed all the little problems,” he says. The entire project took just three days to install and involved opening the roof of the mill and dropping the unit in with a 100-tonne crane. Prep work was central to the success of the installation. “The installation should always be an ‘afterthought’ because if you plan properly and the project is completely thought through beforehand, the execution should be smooth and without problems,” Kordyban explains. They plan to replace the other two step feeders on the large log line within two years. Another recent project for the mill took place at the planer. About three years ago Carrier rebuilt the entire front end of the planer, adding a USNR tilt hoist with lugged let down. After the hoist, lumber runs onto individual lugs and is scanned by a Newnes (USNR) trimmer optimizer and moisture sensor. Boards that don’t make the cut for moisture or quality are automatically dropped out and either sent to be re-dried or to the chipper. A unique addition to the line is a board flipper that will turn the boards wane-side-up before they enter the Gilbert planer. “We remove more of the defect that way,” Kordyban says. where custom equipment is designed to meet the SPF mill’s specific needs. The Tabor mill produces about 300 mmbf a year of SPF on a two-shift basis. For the past 15 years the mill has been tooled to handle small logs from the salvaged pine-beetle kill. of which are treated to two Linden log merchandizers with Porter scanners that determine the best length for value. Kordyban says they are seeing more and more CTL come through their gates. Right now the ratio is 40 per cent CTL and 60 per cent whole logs. 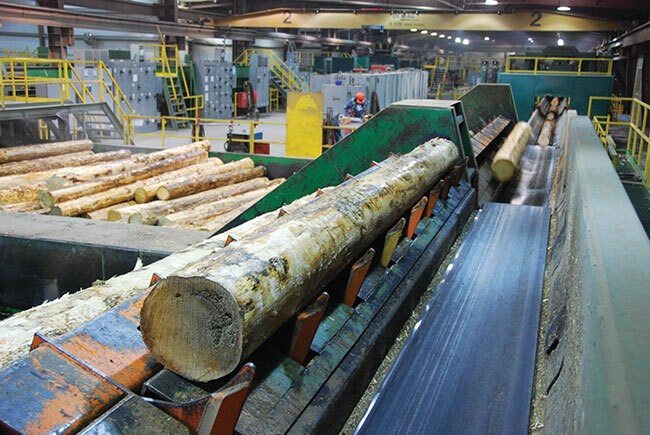 Logs are sent through two debarking lines — a 22-inch Nicholson A8 and a 27-inch Nicholson A8. Both have dual, counter rotating rings. Seeing an increase in the percentage of larger logs led Carrier to install a flare reducer on the 27-inch Nicholson in 2016. Contractors supply Carrier with fibre from their license areas, while most of the volume comes from partnerships with local First Nations, woodlots, community forests, and other open market sources as well as ad hoc trading between other mills in the region. “Although we are competitors, we try to collaborate with other companies in the region by trading for different diameters and species,” Kordyban says. Diversity of fibre sources and adaptability is critical for the company to weather future fibre supply challenges expected in B.C., he says. Carrier Lumber’s history begins with Kordyban’s father, the late William Kordyban Sr., who co-founded the company in 1951 to build and operate small bush mills in various locations. Currently, Carrier Lumber operates the Tabor mill, originally built in 1976. It has seen several massive upgrades over the years, reflecting advancing technology and changing fibre conditions such that the mill has been completely rebuilt. In 2010 Carrier Forest Products Ltd. purchased a sawmill in Big River, Sask., the largest mill in the prairie province. (Read about that mill in the July/August 2016 issue.) The two sawmills have a combined capacity of approximately a half a billion fbm. Carrier Lumber also owns the Bar K Ranch, which births 1,000 calves a year. Kordyban took over operations in 2000 as the second generation to run the Carrier Group of Companies and it appears his two sons are en-route to take over as the third generation. Kordyban attributes the company’s success to the hard work and loyalty of his staff, many of whom have been with the company for 20, 30 and 40 years. “They provide a great example and mentor the young people we have coming into the organization,” he says. Regardless of the challenges expected in the lumber industry, Kordyban wants Carrier to continue to be a fixture in B.C. “When we went through the last recession, we didn’t shut down, we didn’t lay off any people, and found a way to carry on. We will work hard to continue to provide meaningful employment to hundreds of people long into the future,” he says.